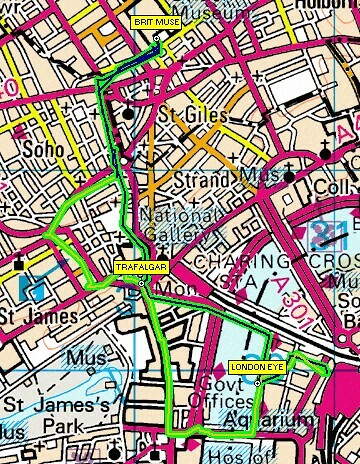 Yesterday I acquired a GPS from Amazon, and I decided to go into London. I wanted to see the Michelangelo exhibition, and test the GPS at the same time. I walked around home a bit to check all was well, and then I headed off for the train. Unfortunately there is no way to get the GPS signals in the train, and so as soon as I left Waterloo station I switched the thing on and found my satellites. I walked up to the London Eye, and then to Trafalgar square, and on up Charing Cross Road to the British Museum. I tend to go to the British Museum a few times each year, and so I decided today to become a friend of the museum, and I joined them. I got a Michelangelo exhibition for just before 5pm. During the day I went around the museum and did some sketching - some reasonable, some not - none what one might see as 'good' on an objective scale, but I enjoy it. I drew Parvati, the consort of Shiva, a drew one of the Parthenon sculptures, 'a blind contour' drawing of a Cypriot chappy, and a 'straight' drawing of him. These should appear on flickr when I get a round tuit. I also did a bit of peoplewatching - I'm not as happy with the sketches that resulted as I was last time I did this, everybody kept moving - it was a conspiracy! The Michelangelo exhibition was pretty good - some of the drawings are incredible, they're so detailed and he makes them look so effortless. I found that even close up, when you can see the individual pencil marks, each one was just right. The place was absolutely packed though - the British museum do a timed entry system to minimise the crowding, but it's still quite busy. I'd guess a very early ticket would be best. On the way back, I walked down Shaftesbury avenue, Haymarket and across Westminster Bridge. This data was put onto a map using OziExplorer, which also outputs data in a Google Earth friendly manner.